Want to know which Google Analytics metrics bloggers should track and why? Google Analytics is a powerful website analytics tool that allows you to track your current blog audience and helps you to better understand your blog readers overall. By tracking Google Analytics metrics, you can measure your blog’s position at the present, its growth over time, and build strategies for bigger success in the future. In this article, we’ll share the 8 most important Google Analytics metrics bloggers should track to increase their success. If you’re running a blog in WordPress, using Google Analytics is very easy with MonsterInsights. MonsterInsights is the most user-friendly and most powerful Google Analytics plugin for WordPress. It allows you to connect Google Analytics with your WordPress blog effortlessly and provides you with all the important metrics about your blog in the most comprehensive way. The plugin makes tracking advanced metrics like forms conversions, eCommerce, downloads, and custom dimensions easy via simple addons. Without the plugin, you’d need to manually set up your Analytics account to track them. The manual setup process is quite complex and a beginner would need to hire an expert to get it working properly. In addition, MonsterInsights creates an Analytics dashboard directly in your WordPress dashboard to allow you to see all the metrics you need right on your dashboard. Therefore, you don’t need to log into another website (Google Analytics) each time you want to see your site’s metrics. By making Google Analytics simple for WordPress, MonsterInsights helps you to concentrate on creating better content and grow your blog with confidence. Now, let’s go ahead and see which Google Analytics metrics you should track for your blog’s success. Please note that you should have MonsterInsights installed on your WordPress site to view these reports. If you haven’t done so yet, install it now following our step-by-step instructions on how to set up Google Analytics in WordPress. MonsterInsights’ Overview report offers you a quick glimpse of your blog’s audience in general. With this report, you can view your blog’s sessions and pageviews for a certain period of time visually in graphs as well as quick reports on sessions, pageviews, average session duration, and bounce rate. This report is available in the MonsterInsights Dashboard widget as well as in the Custom reports page. The Dashboard Widget lets you see your Google Analytics metrics right on your dashboard (no extra clicks required). To view it in the custom reports, you’ll need to visit Insights » Reports from your WordPress dashboard. By default, the plugin shows you reports for the last 30 days; however, you can change to 7 days with 1 click or manually set a custom time range. From this report, you can see exactly how many sessions and pageviews your blog received in the last 30 days. Along with the number of sessions and pageviews, it also shows the percent change in comparison to the previous 30 days. Thus, it helps you see exactly how many users are reading your blog and whether the number of readers is increasing or decreasing. You can utilize this report to discover if your blog is growing or not. Besides, you can see average session duration and bounce rate for your blog in it. These reports help you understand user engagement on your blog. Having more time per session means your readers are really engaged and reading your content, while a higher bounce rate means users are immediately leaving your site. To learn more, here’s our complete guide on how to track and measure user engagement in WordPress. Both new and returning visitors are important for running a successful blog. New visitors are unique visitors who discovered your blog for the first time; while returning visitors are those who’ve already visited your blog at least once and come back again. With MonsterInsights, you can see New vs. Returning Visitors right in the Overview report. It’s available in the Dashboard widget as well as in the custom reports, which you can see by going to Insights » Reports from your WordPress dashboard. In this report, you can see the percentage of your blog’s new and returning visitors. Getting more new visitors means you’re able to attract new eyeballs onto your content and your blog promotions going great. Whereas more returning visitors means your readers are liking your content and coming back to your blog again for more. You don’t need to worry about your new or returning percentage being imbalanced because both are important. Your focus should instead be on increasing the number of both new and returning users. Another important metric bloggers should track is referral traffic and its sources. 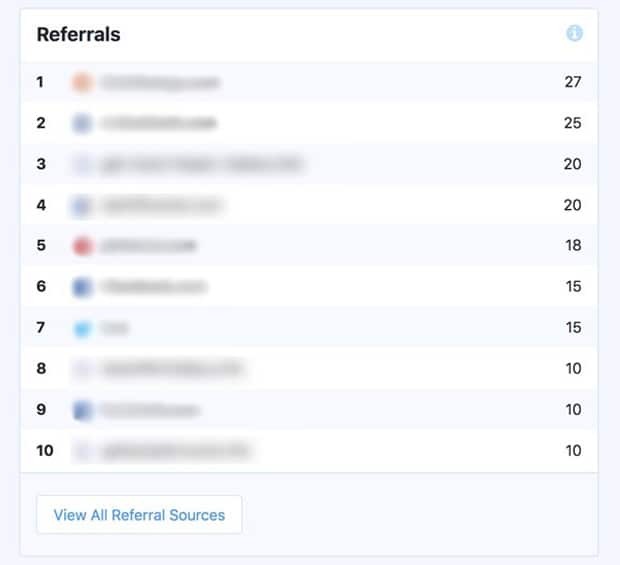 You can find the referrals report right in the Overview report with MonsterInsights. All you need to do to see this report is to visit Insights » Reports from your WordPress dashboard. In this report, you can view the top 10 websites sending you referral traffic. This means that these sites are linking to your blog from within their own content. In short, they’re your blog’s backlinks. You can earn backlinks either naturally or by guest posting. If other bloggers find your content useful to their readers, they can link your blog as a resource site. This is the natural process of earning backlinks. If you have plenty of natural backlinks from top websites, it means your content is great. And those types of backlinks also help your blog to get better rankings in search results. On the other hand, if you’ve earned backlinks by guest posting, you can find out which guest posts are getting you more referral traffic. It helps you to decide which type of content you should create more of for guest posting in the future. If you want to see more than 10 referral traffic sources, you can click the View All Referral Sources button at the bottom of the report. This’ll take you to your Google Analytics account where you can see a more detailed report. Tracking most popular posts helps you to find out what content works best for you. When you’re striving to grow your blog, this report can provide you with several insights for creating more popular posts. Using MonsterInsights, you can view your most popular posts in the Publishers report. You can find that by visiting Insights » Reports » Publishers from your WordPress dashboard. 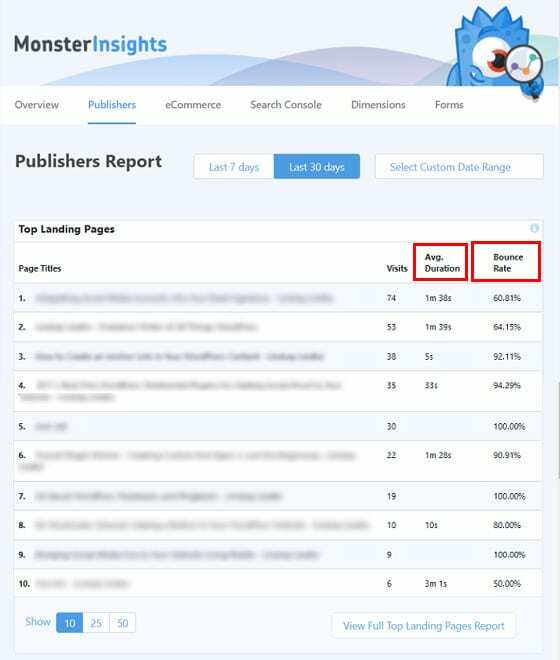 In this report, you can see your blog’s top landing pages with the exact number of visits each has received. Plus, you can see the average duration on the pages and bounce rate. Now you can optimize these top landing pages to improve engagement and reduce bounce rate. For example, if the bounce rate is high because the page isn’t mobile-ready, you can make it mobile-ready. Better user engagement increases your blog conversions as well as SEO ranking. Moreover, with in-depth content analysis of your most popular content, you can identify what type of content you should create for better engagement and conversion. Top Outbound Links are the top links clicked on your site that go to other websites. They’re the links you’re referring your blog readers to visit for related content not available on your site. By tracking the top outbound links, you can find out which websites are getting referral traffic from your blog. This is useful if you’re looking for ways to earn backlinks. Since you’re sending them good traffic, you can contact these sites and ask them to link back to your blog as well. 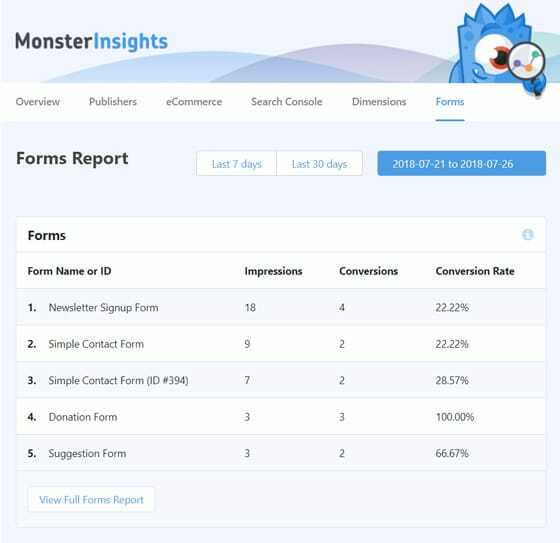 With MonsterInsights, you can view this report in the Publishers report by visiting Insights » Reports » Publishers from your WordPress dashboard. 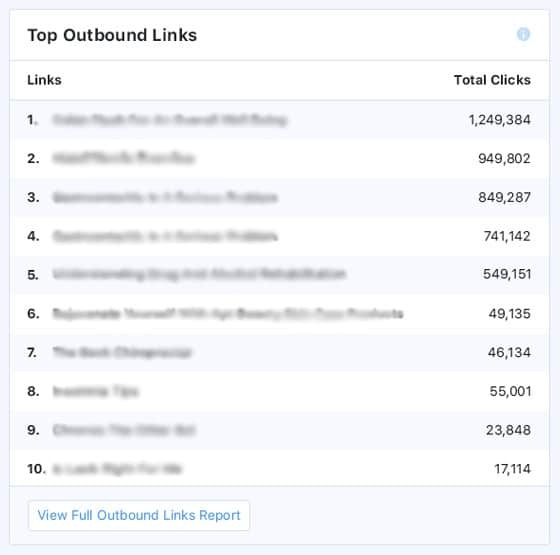 In this report, you can see the top 10 outbound links along with clicks each has triggered. 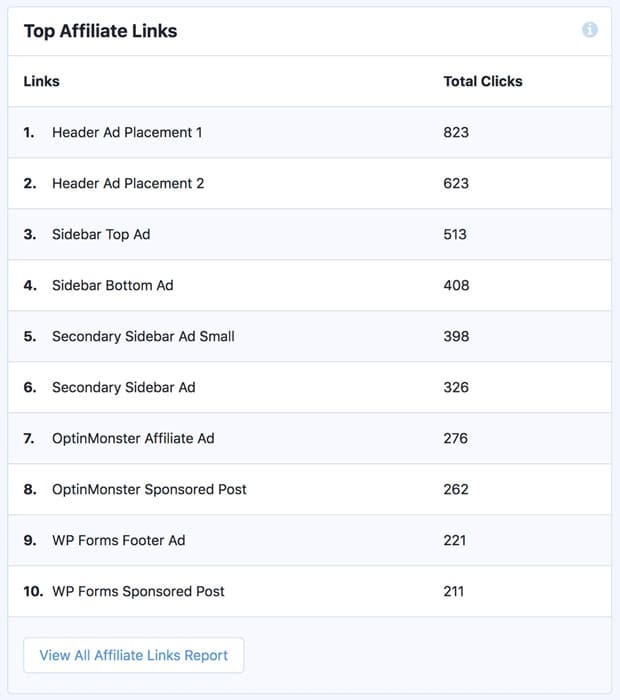 Next to the Outbound Links report, you can see Top Affiliate Links report in the Publishers report. If you’ve added affiliate links on your blog for referral commissions, you’ll want to know which affiliate links are being clicked the most. That’s what the Top Affiliate Links report shows you. Affiliate marketing is a very popular form of marketing technique nowadays. It can benefit both the product website selling a product and the blog promoting the product. If you’ve a blog with a decent number of daily traffic, you can start affiliate marketing for extra revenue from your blog. If you need detailed instructions, here’s our step-by-step guide on how to add affiliate links in WordPress. One of the key indicators of a successful blog is more organic traffic coming to your site from Google or other search engines. Getting organic traffic means your blog ranks for certain keywords people are typing into the search engines. To identify which keywords they’re using, you should track the search terms for your site. 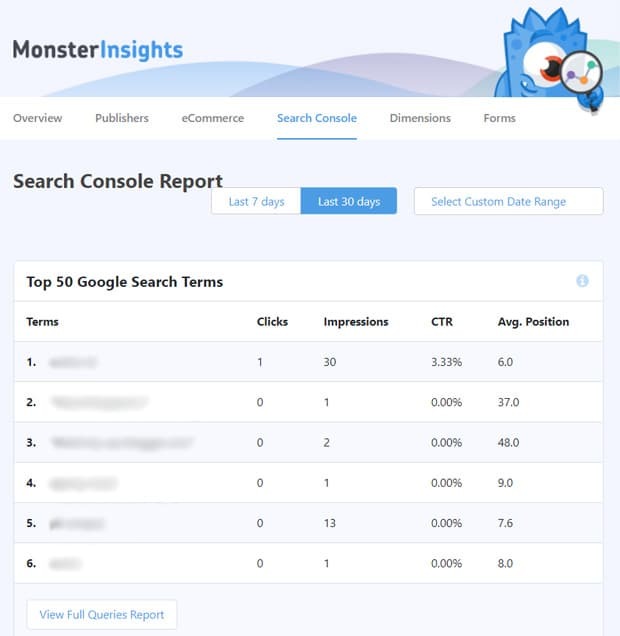 MonsterInsights helps you to connect your Google Analytics account with Google Search Console and allows you to see the Google search terms right in your dashboard reports. To view the top Google Search terms, you need to go to Insights » Reports and click the Search Console tab on the top. There, you can find the top 50 Google search terms for your blog. This is very useful to analyze your Search Engine Optimization (SEO) strategies and improve them. With this report, you can make sure whether your SEO efforts are working for your blog or not. If you see the same keywords you’ve focused on your blog as the top search terms, you can determine that your SEO and content strategies are doing great. If they don’t match, or you see many new keywords that you haven’t used on your blog, you can use those words as the new keywords for your future posts. Google Analytics, by default, tracks certain dimensions which are called primary dimensions. However, if you want to track other dimensions, you’ll have to manually set them up in your Analytics account. MonsterInsights plugin makes it easy to track custom dimensions like top authors, top focus keywords, top post types, top categories, etc. with its Custom Dimensions addon. All you need to do for tracking these custom dimensions is install the addon and set up with just a few clicks. To view the Custom Dimensions reports, you’ll need to visit Insights » Reports » Dimensions from your WordPress dashboard. 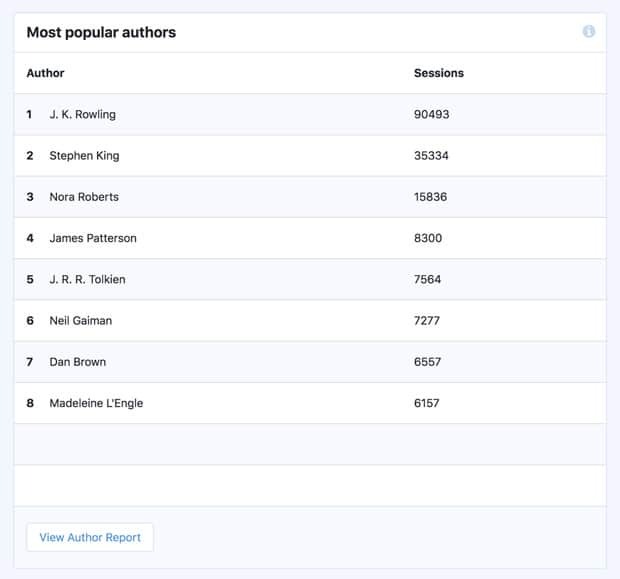 If you’re running a multi-author blog, the Most Popular Authors report helps you identify which author’s articles are the most popular. Now, you can reward the top author and encourage them to work harder. You can also train the rest of your authors to follow the same techniques. This enhances the overall readability of your blog and improves user engagement (reduces bounce rate) which play a great role in improving your SEO rankings. Forms are one of the most important things you’ll need to add to your blog. By adding forms, you can provide an easy option to your blog readers to contact you, provide feedback, and stay in touch. Just adding forms in WordPress cannot ensure the goals being met. Thus, you’ll need to track your forms to see how they’re performing. MonsterInsights comes with a powerful forms addon that helps you to automatically track your WordPress forms. All you need to do to track your forms conversions is to install the addon and activate it. Then, you can find your Forms report in your dashboard reports by visiting Insights » Reports » Dimensions from your WordPress dashboard. As you can see in the screenshot above, you’ll see the total impressions, conversions, and conversion rate for all of your forms. This report helps you to identify which forms are triggering more views and submissions. Then, you can analyze the forms by their type, design, placing on the blog, etc. and optimize for more conversions. By optimizing your forms, you can make your blog more user-friendly, more interactive, and boost engagement. And there you have it! You now know which Google Analytics metrics you should track to optimize your blog for more readership and conversions. 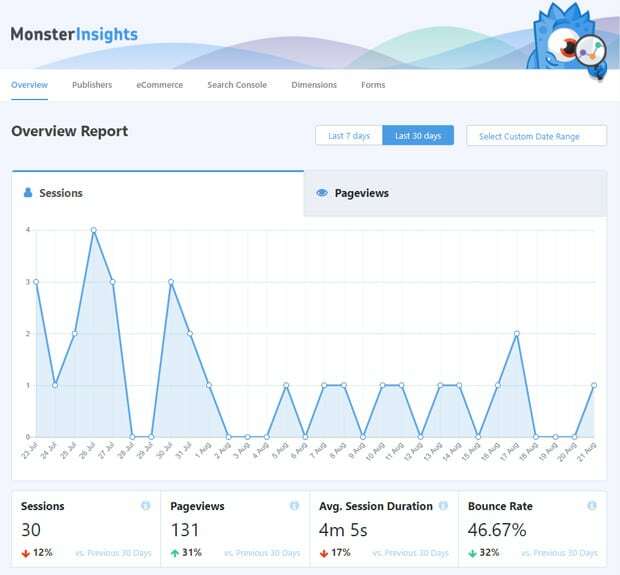 With MonsterInsights, you can track all of the important Google Analytics metrics for bloggers with ease. It makes tracking advanced metrics super easy and helps you grow your blog. So, what’re you waiting for? Install MonsterInsights on your blog and start the optimization.